On Sunday 25th June, the street that runs through our neighbourhood of Stoneybatter will be closed to traffic between 12-6pm for the Stoneybatter festival family fun day. 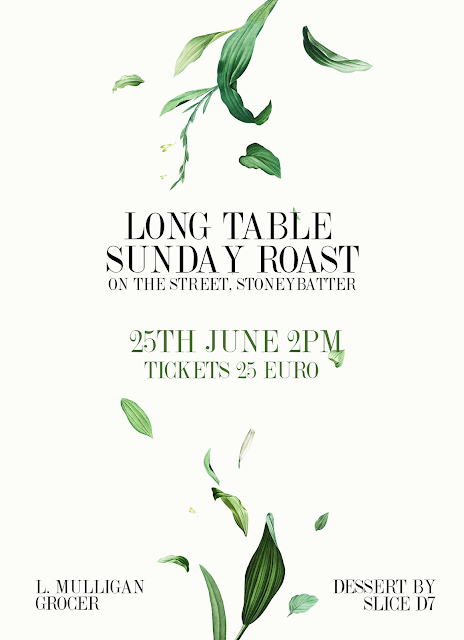 We are hosting a long table Sunday roast running up Manor Street. There are seats for about 40 and booking is essential via this link. We will start with some tasty sharing platters & punch, before moving on to the main course. While Stoneybatter is frequently referred to as Cowtown, for us a Sunday Roast is all about pork. The roast will be rare-breed pork belly with crispy cracking, served with shared platters of Irish baby carrots roasted in local honey, mash made with the last of our Phoenix Park foraged wild garlic and beetroot from our allotment as well as lashings of lovely gravy. Our pals at Slice have come up with a brilliant dessert option to finish off the meal and sustain you through the rest of the festival.